Every year before Yom Kippur, a small percentage of the Orthodox Jewish community performs a ritual called kapporos (or kapparot, depending on your Hebrew dialect) in which a chicken is ritually sacrificed. In recent years, there has been growing opposition to this practice, urging people to use money instead of chickens -- a stance that I support. 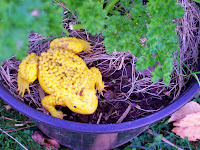 (See my 2011 blog article, The Kapparot Ritual: How tradition has become a travesty). Having viewed numerous videos of kapporos ceremonies on YouTube recently, I would agree that the chickens are definitely not singing. Nor are they very happy. The call heard most often on the soundtracks is the incessant, shrill, high-pitched peeping of terrified, distressed half-grown chicks. Kapporos chickens crammed in a crate. In many kapporos centers, the birds being used are not yet mature enough to crow or cluck. 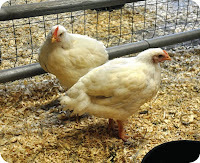 They are factory-farmed, eight-week-old broiler birds, not even fully feathered out yet. They are crammed into crates stacked on top of each other, often without food or water, peeping in miserable baby voices. Most definitely, the children are right. The kapporos chickens are crying. The only time I ever hear that distress call among my own free-range chickens is if a chick is in trouble, perhaps separated from its mother or lost outside the chicken wire fence. 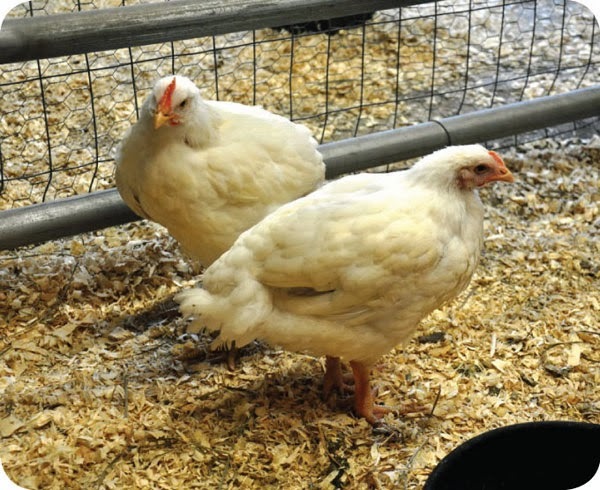 Normally, chickens do not constantly peep or shriek in those shrill, high-pitched voices unless something is seriously wrong. and now living happily in a sanctuary. So why would the parents think the chickens are singing? It seems hard to hear those peeping chickens and not know they are crying. However, most of the people doing this ceremony are urban Jews who know little or nothing about chickens. Most likely, the only time they ever see or hear a chicken is at kapporos time, when the birds are all peeping in distress. They never hear -- and probably do not even know about -- the 40+ different calls that chickens make in free-run flocks where they can express themselves in a natural environment. So it is no wonder that people think the distressed call is normal. They have no idea what a happy chicken really sounds like. The next question concerns why they would say the chicken is "happy to help us." This statement is more about Hasidic theology than chicken biology. What I am about to present will probably seem strange, maybe even offensive to many readers. And yet, this "happy chicken" statement is based on a kabbalistic belief that is central to Hasidic philosophy. Understanding this POV is necessary for learning how to meaningfully dialogue with Hasidim -- a skill you will need if you ever want to convince Hasidic Jews not to sacrifice chickens. 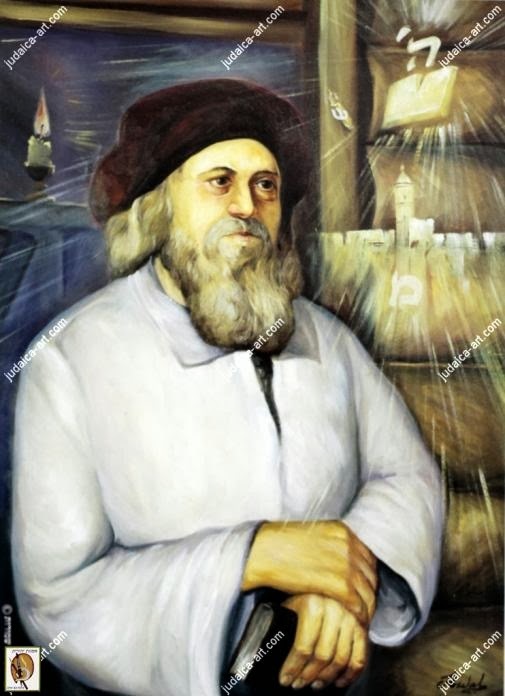 So, my activist friends, I ask you to set aside your pre-conceived prejudices about Orthodox Jews, put on your multi-cultural hats, and follow me into the world of Jewish mysticism. To understand why the parents in the Rina Deych quote would say the chicken is "happy to help us," we must go to kabbalah and a doctrine called "raising holy sparks." Briefly summarized, it goes like this: The "holy sparks" are fallen refractions of the Original Light of Creation, which have descended into lower levels of the material world. These "sparks" (or spiritual "energies") need to be mystically elevated back to their proper places in the universe. This process is part of what kabbalists call tikkun olam, or "repairing the universe." Based on this teaching, many Hasidim and other Orthodox Jews see meat-eating as an essential part of planetary healing, because it raises the souls of animals to a higher spiritual level which, in turn, elevates the energy of the entire universe. I have many times been told that the chickens are hoping to be eaten by Jews at a Sabbath or other sacred meal, and thus have their own spirits elevated through this service to God. I have also seen this explanation given in the Comments sections of articles and videos as to why the person commenting still eats meat. And yet, this teaching is rarely, if ever, discussed among those activists who are trying to end chickens as kapporos. Or, if it is discussed at all, it is only to put it down as, in the words of one activist to me, "a solipsistic conceit" to believe that humans have this kind of central role in the world. This kind of judgemental attitude only hinders the dialogue. So, before all you vegans out there go calling the Jews a bunch of medieval barbarians for believing in this teaching, let me remind you that there is a similar story in Buddhism, a religion that is widely upheld among vegans as the epitome of nonviolence. And yet, Buddhists tell the tale of the selfless rabbit who offered to give his own body to a holy man as food -- and was rewarded by becoming Moon Rabbit, the "rabbit in the moon." (Read the story here.) Folktale? Maybe. But Moon Rabbit is widely believed to have been an earlier incarnation of the soul that would become the Buddha. His story is told to Buddhist children as the epitome of self-sacrifice. Native Americans (Indians) also have similar tales, such as the story of Jumping Mouse, who selflessly gave up parts of himself to help others, and was reborn as a eagle. We should also remember the widespread custom among Native hunters of thanking the animal for giving its life so the people may live -- a prayer that is not unlike the traditional blessing said by Jews before slaughtering an animal. In both Native and Jewish traditions, failing to treat the meat of the animal with respect is seen as a sin that can affect the well-being of the entire tribe or nation. Among the Eskimos, it was widely believed that if one did not honor the spirit of the seal or fish that one ate, then the animals would not reincarnate and the humans would starve. So, as we talk about the Hasidic belief in "raising holy sparks," please see it in the light of these stories from other, better-known (and often better respected) cultures besides Hasidic Judaism. If you can honor the teachings of Buddhism and Native Americans, then at least try to understand similar ideas within Judaism. In fact, the idea that animals might consciously allow themselves to be eaten in order to serve a higher purpose is very widespread around the world. The positive side of these stories is that they all date from a time when people believed that animals have a form of consciousness or soul, and that they can make decisions about their fate. (Read Do animals have souls?, the most popular post on this blog, for an explanation of the soul concept in Judaism). The ability to understand the language of the animals was attributed to Solomon and also to later Jewish sages and saints. In Psalm 150, "everything that has breath" is praising God. So clearly the ancient view among Jews and others was that animals have a form of consciousness. Unfortunately, the insensitivity of Descartes' philosophy has fully penetrated the Western World, including even the more isolated communities such as the Hasidim who use chickens as kapporos. Thus, although the original "sparks" doctrine says that animals -- even those destined for slaughter -- must be treated with respect, the reality of today's meat industry makes that virtually impossible. 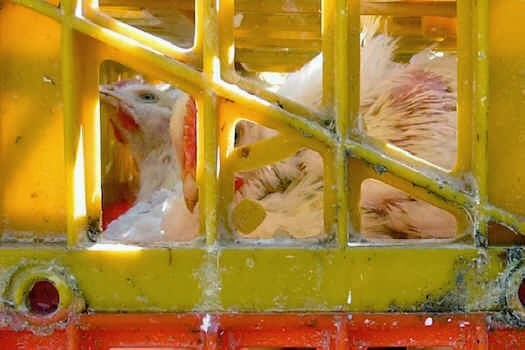 The parents who tell their children that the chickens are "happy to help us" in performing a ritual do sincerely believe this, but, at the same time, they are blocking out the suffering of all those chickens stacked in shipping crates without food or water. All things of this world that belong to man desire with all their might to draw near him in order that the Sparks of Holiness that are in them should be raised by him back to God... Man eats them, man drinks them, man uses them; these are the Sparks that dwell in the things. Therefore, one should have mercy on his tools and all his possessions for the sake of the Sparks that are in them; one should have mercy on the Holy Sparks. Modern kapporos centers certainly are not "having mercy" on the chickens they sell and use for the ceremony, nor are they considering them "comrades in the universe." Many have probably never heard these quotes from their founder. It is doubtful in my mind whether the Baal Shem Tov himself would approve of the way these poor birds are being treated today. As I explained in "The Kapparot ritual: how tradition has become a travesty," this is not the way things were done back in the days when Jews lived in small rural villages. and people raised their own animals. Chickens were not raised on factory farms, trucked in for miles in open trucks, then left to go hungry for days on end. Arguing that "they would be killed anyway" -- as some people do -- is no valid basis for treating them as if they are nothing but inanimate objects. In fact, even inanimate objects (the "tools" referred to in the "sparks" quote above) should be treated with respect -- how much more so should one be gentle with living things! "Raising sparks" is the Hasidic ideal, but today's attitudes often fall far short. Some would condemn the whole culture for this insensitivity. I place the blame on modern urbanization. Since it is axiomatic that one cannot commit a sin to do a mitzvah, we must ask ourselves if the suffering of the chickens under modern conditions fails to raise the sparks and might even be dragging them down instead. We must ask ourselves if the callousness often witnessed at these ceremonies is really the way a true Hasid should behave, or is it a goyishe attitude assimilated from the surrounding gentile culture. I take the "holy sparks" teaching seriously, which is why I have devoted considerable energy to the question of whether or not it is being done properly. Both in the above-mentioned interview with me by Richard Schwartz and this 14-minute video (below) that I posted on YouTube, I present arguments from within the Hasidic tradition as to why I believe "raising sparks" through eating meat is no longer possible under the conditions of the modern industry. I encourage you all to study both of these resources, so that, next time you are told that kapporos chickens are singing in joy to "help us," you will know how to answer with respect and understanding. UPDATE 2014: I have written a one-page handout directed at Hasidim on the issue of not using chicken for kapporos. No, it is not vegan or even vegetarian, but it is not directed at vegetarians, it is intended for Hasidim and argues from within the context of Hasidic thought. Download the PDF here. Feel free to print and hand it out, adding your own local contact info at the bottom. See also: The Baal Shem Tov did it with a chicken, so why are you telling me not to? -- my answer to this Frequently Asked Question I often get from my fellow Hasidim. I have given considerable thought in the past few days about what works and what doesn't in the anti-kapporos protests. As someone who is both a Hasidic Jew and an opponent of using chickens for kapporos, I'd like to offer some thoughts to fellow activists on how to be more effective in the future. To being with, we need to remember that even among "the Orthodox," only a small minority do this ceremony with chickens. There are over a million Jews in New York City, and, according to recent polls, 40% of them identify as Hasidic or Orthodox. So even if 20,000 chickens were sacrificed, that is only 5% of the Orthodox community. It is important to keep this statistic in mind, and not paint all religious Jews with the same angry brush. In the same vein, not all of these guys are rabbis, either, even if they do have beards and dress in black. This is standard dress for all Hasidic males, even total ignoramuses. Wearing the clothes is no guarantee of sainthood! So please, unless you actually know that a particular person really is a rabbi, don't refer to him as such in your articles and blogs. In many cases, the smart-alecks mouthing off across the barricades may be no more than teenagers acting out -- and every community has those! (In some news photos they don't even have beards yet, proof positive that they are still youngsters.) Not that I approve of profanity or sexist remarks, but it is usually not "the rabbis" making them. And the guy slaughtering the chickens is probably not a rabbi, either -- just a butcher trained in kosher slaughtering. On the other hand, out in Los Angeles there were signs calling it "murder," and comparing it with the Holocaust that I (and other Jews) found offensive. Nor were the Jews at the kapporos centers completely innocent of bad behavior either -- there were reports of Hasidic men making sexist remarks to women protesters and accusations of antisemitism on both sides. (Read this post by a LA protester.) All of which goes to show that shouting insults across the barricades is not a very effective way to change anybody's mind. So let's take a look at what works and what does not, to improve effectiveness for next year. 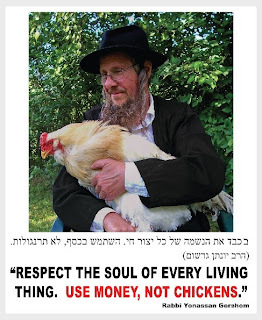 If we look at the statements of rabbis who have said to use money instead of chickens, not one of them has called it "murder" or compared it with the Holocaust. In Jewish law, the word "murder" applies only to humans. That may be specie-ist in your eyes, but it is the cultural reality. If you call it "murder" this is heard as equating the life of a person to that of a chicken in a derogatory way. Ditto for calling it a "holocaust" or a "genocide." Judaism has laws against animal cruelty, but "murder" is not one of them. Using that term only creates hostility to our message. 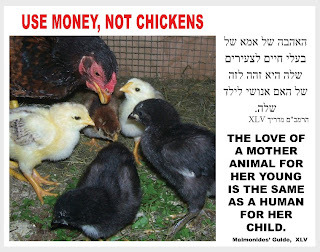 Not one of the anti-kapporos rabbis has said it is morally wrong to kill a chicken, either. In fact, not all of them are even vegetarians -- as for example, the CEO of the Orthodox Union, which certifies kosher meats, but who nevertheless said his org does not endorse kapporos with chickens. 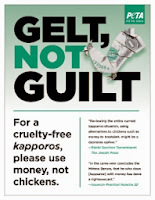 So most of these rabbis probably eat meat, yet many have recently issued statements urging people to use money instead of chickens -- indicating that one does not have to be vegan to oppose this particular ceremony. 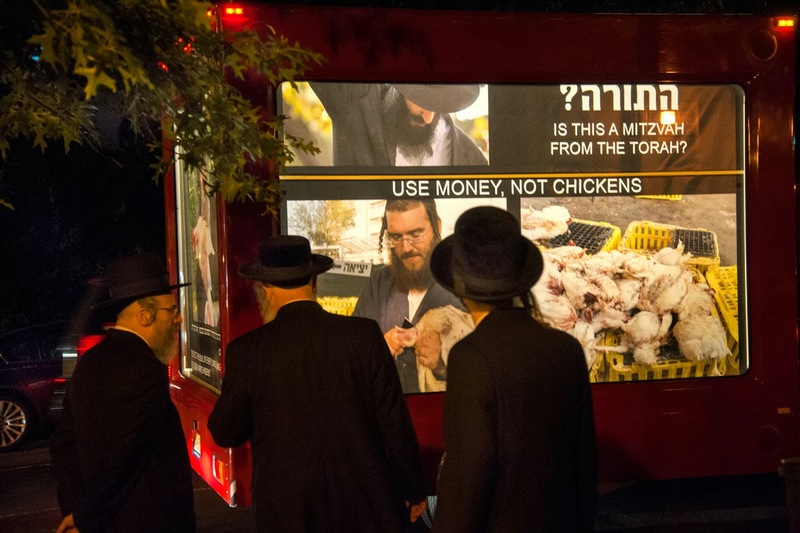 Rabbi Shlomo Zalman Auerbach (1910-1995), a leading authority on Jewish law and head of the Kol Torah yeshiva in Jerusalem, also stopped using animals for kapparot, giving charity instead. In 2010, Rabbi Steven Weil, CEO of the Orthodox Union of Rabbis in New York City, told the Alliance that the OU opposes using chickens as Kapporos due to the ritual’s “insensitivity” to the birds and the lack of historical foundation. Rabbi Shlomo Segal, Rabbi of Beth Shalom of Kings Bay in Brooklyn, states: “The pain caused to the chickens in the process of performing Kapparot is absolutely unnecessary. Giving money is a more humane method." 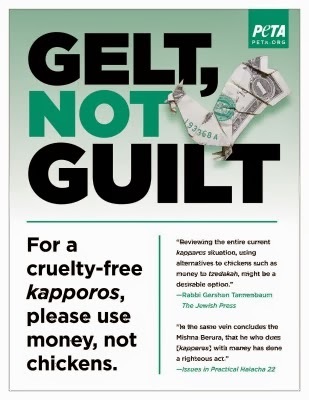 In September 2013, the newly-elected Ashkenazi chief rabbi of Israel, David Lau, warned kapparot organizers that the failure to treat animals decently is a violation of religious law. All of these rabbinic authorities have cited the cruelty and suffering of the birds under modern conditions as a violation of tsaar baalei chayim (the prohibition against cruelty to animals). That is the most acceptable argument among Orthodox Jews according to Jewish law. We should take a cue from that and discourage people from using the words "murder" and "holocaust," and focus instead on the issue of cruelty in the ceremony as it is being practiced today. (I do not mind the word "torture," though -- I use it myself.) Remember: the goal is to stop the use of chickens, so whatever argument works best is what we should use. No rabbi is going to outrightly forbid slaughter or meat-eating, because the Torah permits it, and it is axiomatic that you cannot "forbid the permitted." However, every person is free to choose for him or herself whether or not to eat meat or, in this case, use chickens in the ceremony. So everyone in the "End Chickens as Kapporos" movement needs to stop and ask themselves: Which is more important, to be politically correct in the vegan world, or to be effective in the Hasidic world where the ceremony is being practiced? This why I have taken the approach of saying that the suffering of kapporos chickens under modern conditions cancels out any good the ceremony might have had in past centuries. I often tell the story from the classic text, Shicvchei Ha-Ari, about how the great 16th-century kabbalist, Rabbi Isaac Luria, told a student that he had lost his place in the World to Come (Jewish equivalent of going to hell) for failing to feed and water his chickens properly. The cries of those suffering chickens were canceling out all the prayers and Torah learning of that student. I then point out that I believe the same thing is happening today with kapporos chickens, that the suffering cancels out the prayers. This way, I do not condemn people's ancestors for having done it with chickens in the past. 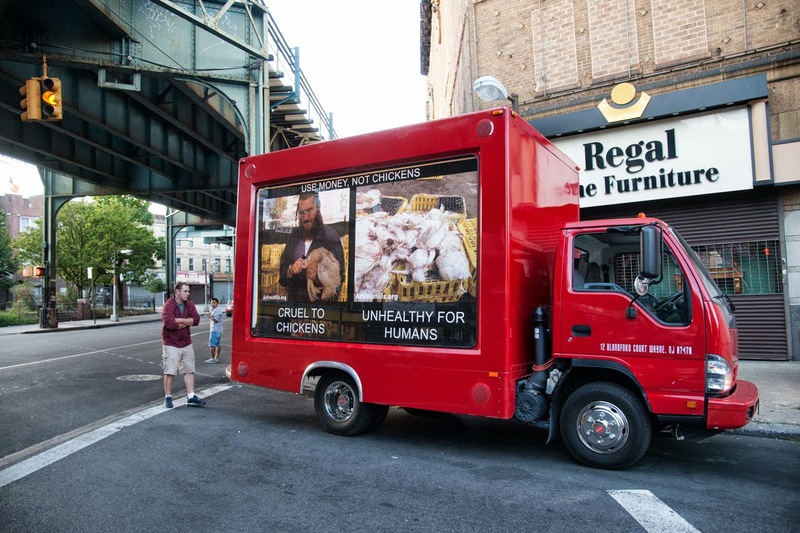 I do not condemn Moses for eating meat or the Hasidic Rebbes (who are much more than a rabbi -- a Rebbe is regarded as a saint, somewhat like a guru) for having done it with chickens. And I NEVER talk about how "customs can be changed" -- that is a secular approach that will be rejected as assimilationist heresy. Assimilating into the secular world is seen as the greatest threat to modern Jewish survival. Nor do I use satire with rubber chickens and such, because this is interpreted as antisemites ridiculing the Jews. Instead, I focus on how you cannot commit a sin in order to do a mitzvah. (And yes, they do regard this as a mitzvah. In the Jewish world, a custom (minhag) often takes on the authority of law within specific communities.) I also focus on the idea of voluntarily choosing not to use a chicken -- even though it is permitted by Jewish law -- as a personal khumra, an extra strictness that one voluntarily takes upon oneself. Within the Hasidic world, taking on extra khumras as a personal discipline is acceptable -- even admirable! -- behavior that allows a person to make a humane choice without demanding that we "forbid the permitted." Of course, these arguments take a lot more inter-cultural education and understanding than simply shouting "meat is murder." It means being able to step into the other culture and respectfully dialogue from within its own worldview, even if you do not agree with it. It means treating the "other side" with respect, even if you yourself are being reviled by them -- and perhaps remembering the prayer of St. Francis of Assisi: "Make me an instrument of Your peace: Where there is hatred, let me sow love." A stance that Gandhi would also agree with. Nonviolence is not only physical, it is verbal as well. So once again, we need to ask ourselves: What works and what doesn't? See also "Kapporos Chickens Don't Sing!" -- another article by me, explaining some of the kabbalistic and cultural contexts of Hasidic beliefs that you need to understand in order to be more effective in your dialogues with Orthodox Jews. One of the basic premises of any campaign is to know your target audience. So please, take the time to educate yourself. See also: The Baal Shem Tov did it with a chicken, so why are you telling me not to? -- my answer to that question (which I frequently get from my fellow Hasidim).